Already, Henderson is thinking ahead to 2004. She follows a USOC training schedule which has her lifting weights, running, and, of course, throwing. Besides regaining her riseball, she needs to perfect new pitches and get quicker if she hopes to make the next Olympic team, which is not a foregone conclusion. Danielle Henderson 99 smiles almost sheepishly as, for the umpteenth time, she pulls the heavy gold medallion from her pocket. Its the first thing people ask, says the UMass softball hero about post-Olympic appearances as diverse as world series baseball games in New York City and grade-school classrooms in Hadley. Although shes just turned 24, the prime of life for most athletes, Henderson is the rookie of the pitching staff for the gold-medal-winning womens national softball team, and one of the younger players on the entire squad. This is a team thats dominated its sport like few others, at one point winning 112 consecutive games before losing to Japan in a preliminary game at the Sydney Olympics last September. For Henderson, who likewise dominated her opponents while leading UMass to two college World Series and setting a long list of school records, breaking into the big time with the national team hasnt been easy. In her only appearance of the Sydney games  a 3-0 win over Cuba  she struck out seven batters in five innings. But she also committed two throwing errors and frustrated herself on the mound. Oh yeah, I was nervous, says the shy six-footer with a chuckle. I wont lie to you. And though she breezed through last summers 60-game U.S. tour with nine wins, no losses, and one perfect game, she also struggled with her riseball, the pitch that made her near-invincible in college. She struggled under a new coach and in the unfamiliar role of new kid on the bench. After a career at UMass as the teams star pitcher  the one coach Elaine Sortino put on the mound for every crucial game  she was a little awed by her surroundings. But Henderson also had an abundance of those elusive intangible qualities that coaches talk dreamily about  attitude, focus, and work ethic  and those qualities helped her excel in a region where early-season games are sometimes snowed out. Indeed, says Sortino, Hendersons collegiate achievements  establishing an NCAA record by pitching 105 consecutive scoreless innings, and winning the Honda Trophy as the nations best softball player of the year  are all the more impressive because she played so far from the sunny softball havens of Arizona, California and Florida. The December morning is dark and icy cold but Danielle Henderson, her wispy breath rising in a yellow-green sodium light, is tossing pitch after pitch into a backstop. Henderson is in the dungeon, a reverberating concrete underpass beneath Commonwealth Avenue that connects the Boyden Gymnasium basement to the frozen playing fields outside. Here shes spent the past few winters perfecting her pitches, and here she still trains when the weather forces her inside. Its the only place where you can get on the dirt, she says. The dirt in this case is a wooden box several feet square and filled with clay, where Henderson and the other UMass pitchers can simulate the feel of pushing off a real pitchers mound. Already, Henderson is thinking ahead to 2004. She follows a USOC training schedule which has her lifting weights, running, and, of course, going to the dungeon several times a week. Besides regaining her riseball, Henderson says she needs to perfect new pitches and get quicker if she hopes to make the next Olympic team, which is not a foregone conclusion. She will have to prove herself to the selection committee, just as she did at the 1999 tryouts where she was one of sixty athletes asked to compete for a spot on the team. Henderson says she started dreaming of pitching in the Olympics in 1996, when she went to Atlanta to watch the first-ever Olympic softball medal games. There she saw most of her idols  Lisa Fernandez, whom she emulated as a youth and still does; Michelle Smith and Jen Brundage  win the gold, and she vowed to join them. The following year, her sophomore season at UMass, Hendersons skills and reputation rocketed like her famed riseball: She won 25 games, including three no-hitters, and helped carry the team to a college World Series appearance. After a great junior year and another trip to the series, she was invited to try for the national team, and the Olympics seemed within her grasp. 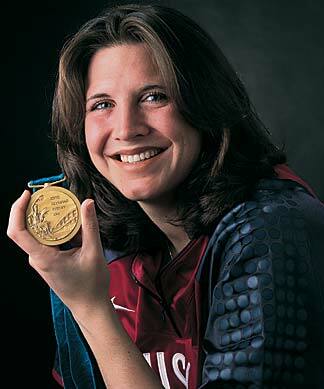 As she received her sport management degree in June, 1999, she was preparing to play in the Pan Am Games, generally considered an Olympic proving ground. Henderson knew shed play a supporting role in Sydney. Shed been told by U.S. coach Ralph Raymond that shed get a start, as she did against Cuba, but that the veteran pitchers would carry the team through the medal round. Henderson vowed to contribute what she could, to enjoy the experience, and to learn for future Olympics; but she was not prepared to see her idols struggle, too. The U.S. team that had seemed so invincible lost three consecutive games in Sydney, and nearly failed to qualify for the medal round. Sortino went to Sydney to see her prodigy in the biggest moment of her young life, but was somewhere over the Pacific when Henderson took the mound against Cuba. The coach arrived just as the losing streak began and the teams mood darkened. As it turned out, the U.S. ship righted itself after losing to Australia and holding a voo-doo cleansing in the shower that was widely reported as a turning point. Henderson says the playful ceremony did seem to bring the team together and break the tension. It was symbolic, she says. It gave us a fresh start. They didnt lose again, and avenged their early loss to Japan in the gold medal game. This summer Henderson and most of her Olympic teammates will reunite as the gold team in a newly formed professional softball league. That will be an opportunity, says Sortino, for the pitcher to make a name for herself at the highest level and to better her chances for Athens in 2004. But until then Henderson will train in cold, dark New England and occupy a familiar dugout as assistant coach of the UMass womens softball team. She says she hopes her Olympic cachet may help bring new talent to UMass, and that her experience in Sydney can inspire another generation of Minutewomen pitchers. Whatever happens in the short run for Danielle Henderson, those aspirant hurlers will be reminded of Harrys reign on campus for a long time to come. In recognition of her extraordinary undergraduate career and her swift rise to the Olympic level, Hendersons number, 44, will be permanently fixed to the outfield wall at the new softball complex in May. During a ceremony held just after the Olympics last fall, she became the first female athlete to have her number retired at UMass.